Happy New Year to All! As we all look forward to what a new year will bring, it’s the time in which we can look backward as well to reflect and to learn. I’m excited that this is the 20th Anniversary Year for Golden LEAF. On October 22, 1999, the Foundation filed its founding document – the articles of incorporation. It has been a challenging and rewarding time as the Foundation has worked to live out its mission of economic transformation. We are taking various steps to celebrate together and to look ahead to better work and additional progress. This issue of Golden LEAF News showcases some of the highlights of these 20 years. I hope you enjoy learning or re-learning about some of our actions and subsequent results. Over 300 Golden LEAF Scholarship recipients participated at the Golden LEAF Scholars Leadership Program conference this weekend. Pictured are graduating seniors with Dan Gerlach, Golden LEAF President. Much of this came before my arrival at the Foundation 10 years ago. I am blessed to have the opportunity to serve the Foundation, to follow an outstanding leader – Valeria Lee – the first president of the Foundation, to work with dedicated and selfless Board members from across North Carolina, and to partner with colleagues on our staff – many of whom are from rural North Carolina – to move forward together. And there is much more to do. You can also read about one of our longest standing programs of work – Golden LEAF scholarships. 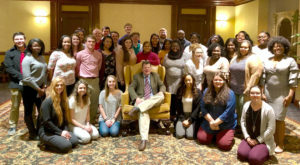 For nine years, we’ve funded a leadership development program for students from rural North Carolina attending NC public and private colleges, providing support for them to find internships back in their communities. It is personally rewarding for me to see these scholars take advantage of these opportunities, and often choose to go back to work in businesses, schools, farms, and hospitals in rural North Carolina. 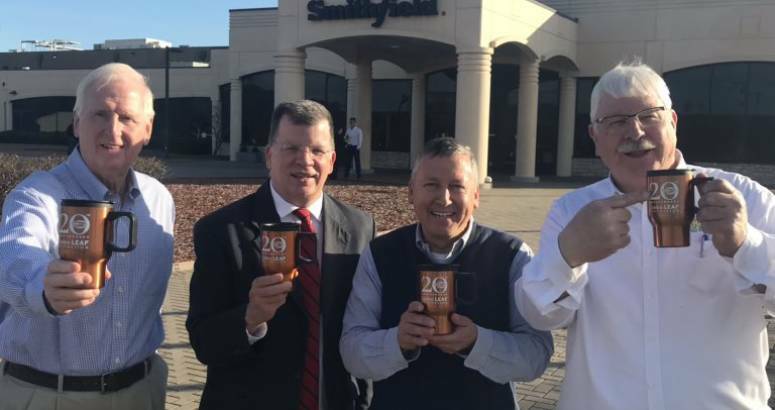 And for fun, you can check out the challenge that I’ve made to my longtime friend Kevin Leonard, the executive director of the NC Association of County Commissioners and key Golden LEAF partner, to visit all 100 counties in 2019. Kevin has accepted, and you can track my progress by following @ncLEAFchief and @NCgoldenLEAF on Twitter and @NCgoldenLEAF on Facebook. The diversity and the breadth of the state make it a wonderful task.